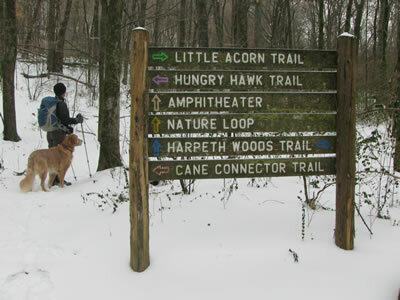 We are very familiar with the Harpeth Woods Trail. 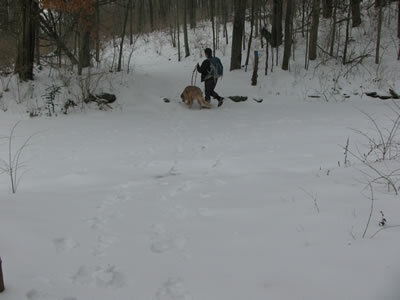 We do not hike there as often as on the trails in Percy Warner Park, but who is counting. 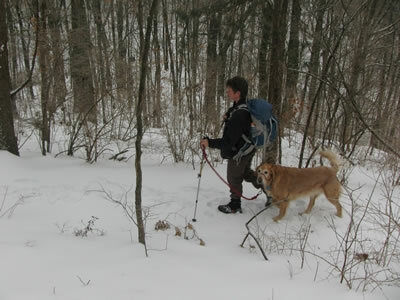 It is a good outing on a solid trail. Directions: Go Interstate 40 to exit 199. Old Hickory Blvd. Exit and take Old Hickory south - towards Bellevue. Continue straight on Old Hickory for 3.5 miles, until it "T’s" into Highway 100 at a light. Turn left on Highway 100. The Park entrance is on the right in a .20 miles. Once in the Park, turn left on the first road to go to the Nature Center. 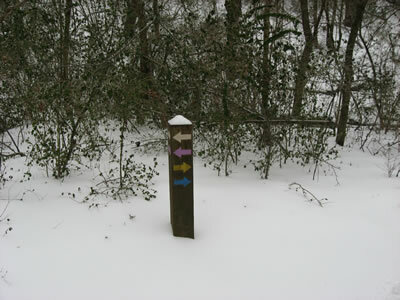 There are three trailheads in Edwin Warner Park which access the trail: Owl Hollow (near Butler Field), Natchez Trace Trailhead, or the Nature Center Trailhead. 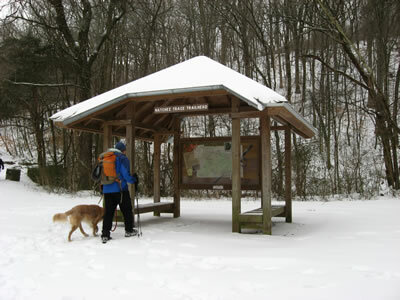 The Nature Center Trailhead has a map kiosk, restrooms, water, and good parking - what more can a hiker ask for? 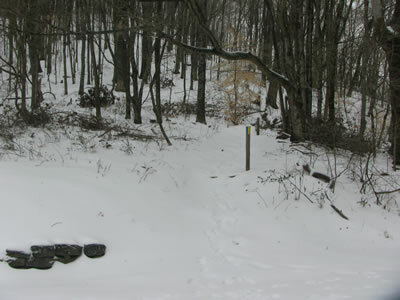 From the trailhead kiosk (located to the left of the Nature Center) start on the trail and cross Vaughn Creek. 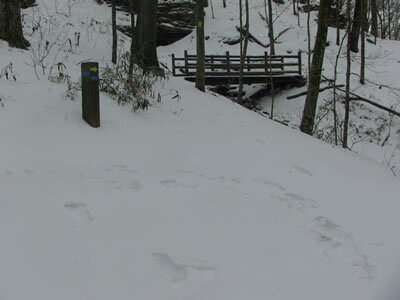 The Harpeth Woods Trail uses blue blazes. There are many trails located near the Nature Center and they are each blazed in a different color. The sign post looks a bit like a rainbow, but the trail is well marked. Just follow the blue arrows or blazes. At .15 miles the trail crosses the Old Roadway. There are no vehicles on the road but beware there could be some pretty fast walkers. The blazes on the post are now just blue (Harpeth Woods Trail) and yellow (Nature Loop). From the road the trail climbs steeply with a couple of switchbacks for .10 miles. At a trail junction the yellow trail goes to the right and crosses a visible bridge. Continue following the blue blazes. Leveling out the trail crosses a ridge into a saddle before it climbs again. Take heart, the climb is shorter than it looks. After a few hundred feet the trail angles off to the left and skirts the top of the hill. 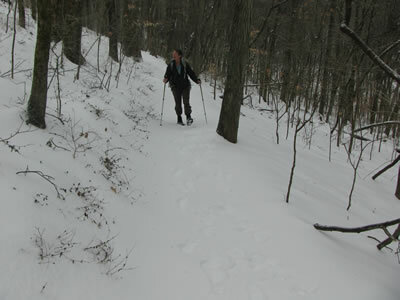 After contouring to the south side of the knob the trail begins to descend. After a few descending switchbacks the trail intersects the Old Roadway, again. It is .80 miles from the trailhead. Once again no traffic is on the road, but look out for those fast stroller pushers. At the road the trail joins the road for a short distance. Turn right and head for the bench and blaze post on the other side of the road. The trail junction is also a road junction, just to complicate things! 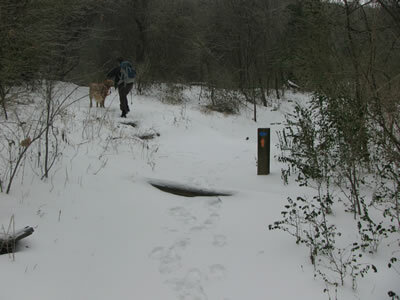 The road comes up from the Little Harpeth River Picnic Area accessible from Vaughn Road. The trail leaves the road and continues heading south. Descending the trail weaves through rock outcroppings and reaches the Owl Hollow Trailhead after .30 miles. 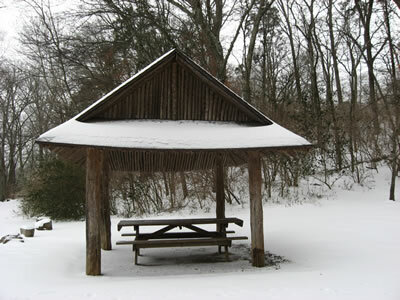 The trailhead has limited parking, a directional trail sign, and an old picnic shelter. The Owl Hollow Trail is blazed orange. 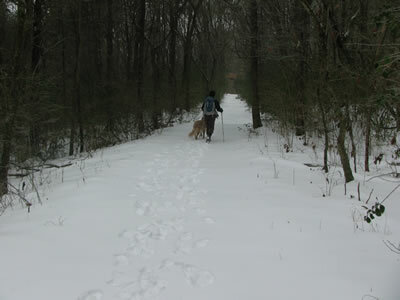 From Owl Hollow Trailhead hike uphill following the shared Harpeth Woods and Owl Hollow trail. After a few hundred yards the Owl Hollow Trail branches off to the right. The blue blazed Harpeth Woods Trail continues uphill for a short distance and then levels as it dips and curves in a delightful section of the path. Another leg of the Old Roadway is reached after .25 miles from Owl Hollow. The trail crosses the road and strolls along for .10 miles to the Old Quarry junction. 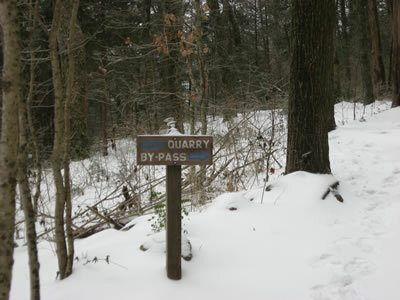 To view the Old Quarry, take the left trail. The trails re-unite in about .10 miles. From the Old Quarry junction, the trail climbs one last short incline and then begins a rocky descent to the Old Natchez Trace Road. 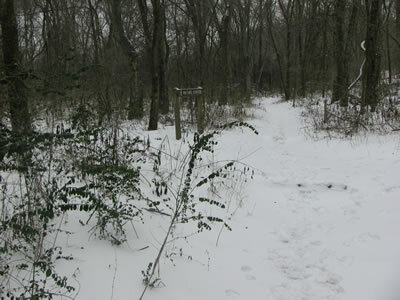 The Old Natchez (an old dirt road) follows Vaughn Creek back to the trailhead. 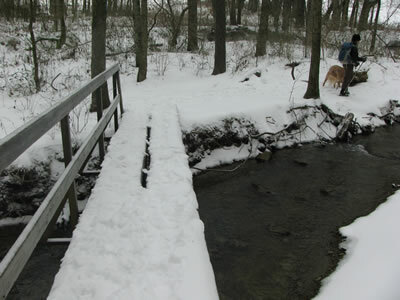 A bridge crosses the creek after .20 miles. Continuing the Natchez Trace Trailhead is reached in another .10 miles. 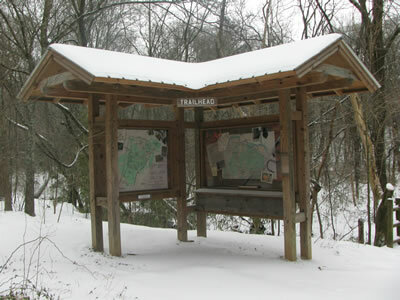 The trailhead features parking and a great kiosk. 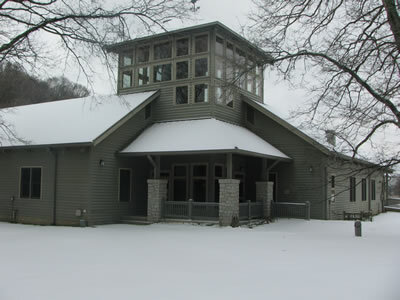 The Harpeth Woods Trail, Harpeth River Greenway, and the Old Roadway are all accessible from the trailhead. From the trail kiosk the trail crosses the Old Roadway and continues along the creek. The almost level path crosses another bridge in .10 miles. The yellow blazed Nature Loop comes down the hill and crosses the creek on a nice bridge, re-joining the Harpeth Woods at .25 miles (from the last kiosk). Continue along the creek. Cross another bridge with a stair climb to reach the span. 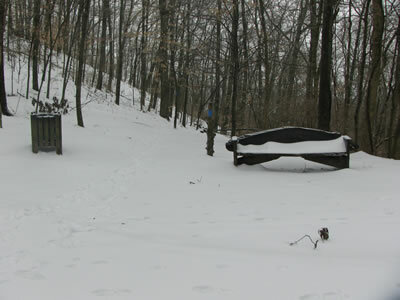 A sign indicates the return trail to the Nature Center. 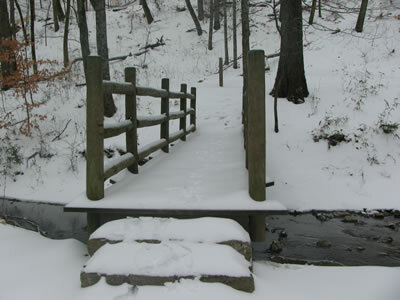 The total length of the trail is 2.5 miles.